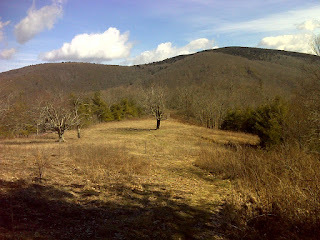 Hiked in my shorts from sunrise to sunset today (Day 48, Thursday February 23rd). And during the middle of the day, even at 4500 feet, it was hot enough that I was sweating wearing only the shorts and a short-sleeve t-shirt. It was well into the 70's down in the valleys. What a change from just a couple days ago! 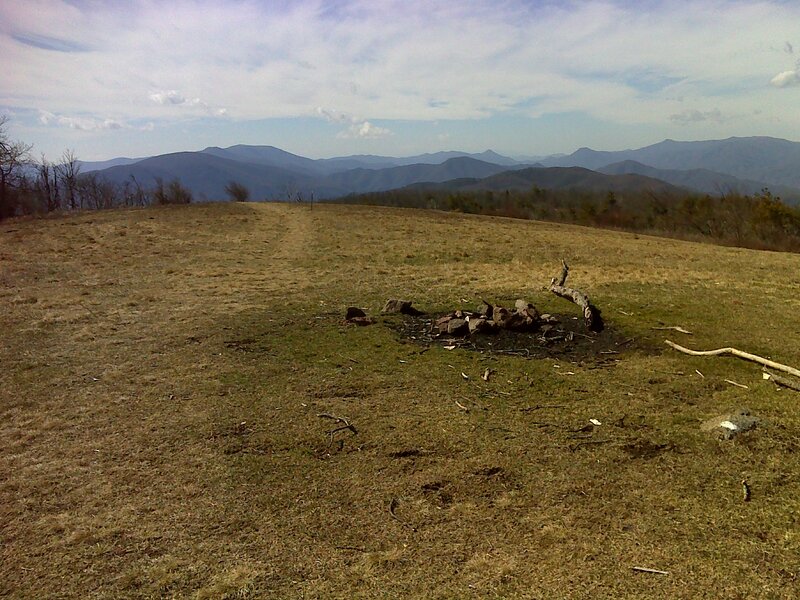 Now, Unaka Mountain, at 5180 feet, was by far the highest point of today's hike. It entirely lacks vistas. The south slope looks as if it was once a bald, now sporting shrubs mostly less than ten feet in height. But the north slope was a pretty, if wet, walk through mossy spruce and rhododendron - a nice rain-forest-like change of pace. 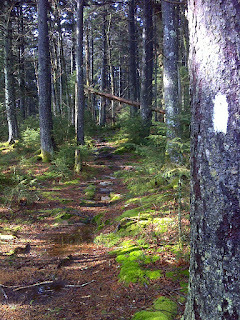 Finally, the northern five mile stretch of trail had a special character of its own. It consists of a 'rehabilitated' stretch of 'brain-dead, bulldoze-ahead' trail that originally followed the Tennessee-North Carolina line religiously, 'come hell or high knobs'. The old trail is still visible, plowing up and down every big and little summit. The most prominent of these are named on the trail map: Big Ball, Piney Ball, and Little Bald Knob. The new trail gracefully bypasses all three of these summits, and also skips lesser examples of pointless ups and downs using evenly sloped side-hill grading and occasional switch-backs. 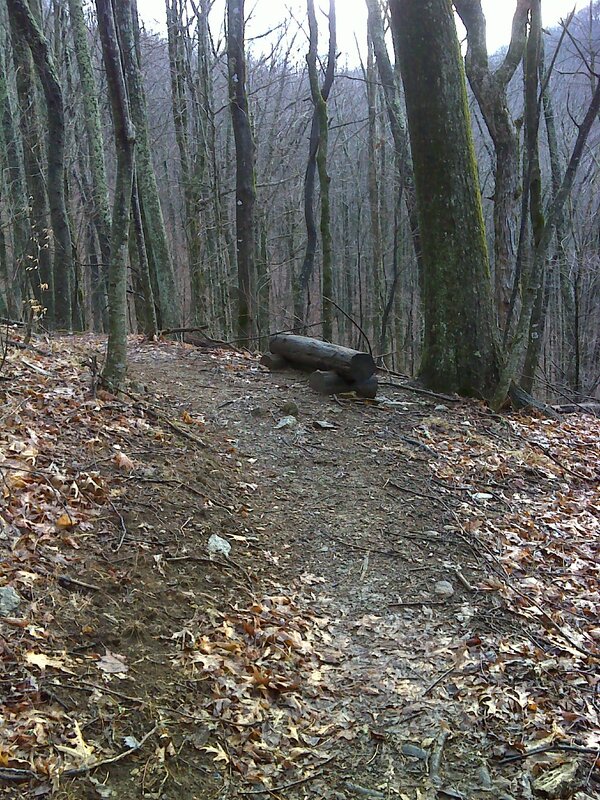 The designers even provide a rest stop on the side slopes of Piney Ball, as the trail smoothly connects Cherry Gap with the unnamed saddle to the north. I found myself imagining the broad-brush with which the original trail was located, way back in the early days when trail resources were desperately limited: "Just follow the state boundary" I can hear someone saying. Thank goodness that a little more reason - and a lot more energy - has gone into trail location and construction since those pioneers first pushed the AT through this area. The map shows my route as recorded by my GPS. 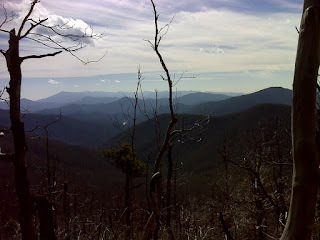 Click the title to see a bunch of additional photos taken along the way.